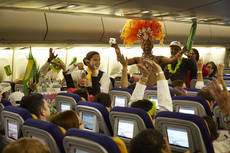 It is one of the most iconic Lufthansa flight numbers: LH500 to Rio and during the night between Saturday and Sunday the highest Caipirinha party in the world took place on that flight. During the aperitif service shortly after take-off at 10:15pm, 352 passengers, hosted by 14 flight attendants, enjoyed the Brazilian national drink mixed from Cachaça, lime juice, sugar, and ice. The presentation of the cocktails was exceptional – six trolleys were transformed into mobile bars wrapped with the Brazilian national flag. Along with samba-dancer Paula Souse and Conférencier Sergio Neves, who was giving useful travel advice to the international passengers for their trip to the Copacabana and the Sugarloaf Mountain, social media star Klaus-Heidi was on board as well. The Swede moved from Scandinavia to Berlin, after he had changed his name as a result of a popular internet competition, to live in the German capital for one year. Flying at an altitude of 39,000 feet, the passengers aboard the Boeing 747-400 were able to experience the extraordinary Brazilian atmosphere with South American Samba and Boss Nova rhythms directly at their seats. Every passenger received a special Lufthansa party package containing a sports cap, colorful garlands, a music CD, and fan make-up. Thanks to FlyNet, the broadband Internet access for the long-haul fleet, the Lufthansa Social Media Team was able to send first posts and tweets to Facebook, Twitter and Instagram (#LufthansaCaipiParty and @klausheidiberlin!). During the upcoming weeks, Brazil and soccer will play a unique role at Lufthansa. Two weeks ago, a special “Fanhansa” livery was introduced for 8 aircraft – some of them are already flying as “Fanhansa”. Among others was a Boeing 747-8 that took off to Sao Paolo last night. The Caipirinha from the flight to Rio de Janeiro is not only offered on LH500, but also in Business Class and First Class on all long-haul flights departing Germany. Brazilian snacks and drinks will also be served on German domestic flights in Business Class during the famous “Blue Hour” on Friday evenings. On the 15th of August 1956, Lufthansa opened its first South American service flying the route Hamburg – Düsseldorf/Frankfurt – Paris – Dakar – Rio de Janeiro – Sao Paulo – Buenos Aires with the Lockheed L-1049G Super Constellation. Today, Lufthansa flies to Sao Paolo daily from Frankfurt and Munich, partly with the new Boeing 747-8. Lufthansa is also flying daily from Frankfurt to Rio de Janeiro, its second Brazilian destination.